Use Ireland car hire to discover the amazing sights of this unique landscape at your own pace. Out on the very edge of Europe , the Wild Atlantic Way stretches for 2500km along the western seaboard . The route is split into 4 sections – The North West , West , Mid West and South west. This 5 night tour visits the North West section of the route visiting areas such as Donegal, Leitrim and Sligo. 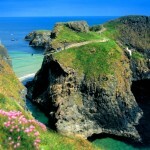 As you travel you will experience the rugged craggy coastline of the North West of Ireland. This is the perfect tour to explore the rich social , cultural and historical tapestry of Ireland . Arrive Dublin and travel to Belfast. While Belfast in a fascinating city, as you travel in that direction from Dublin, you will be passing through some of the most history laden areas of Ireland. Amongst the sightseeing opportunities today will be the megalithic tombs at Newgrange, the Hill of Tara and Trim Castle. There is also the beautiful scenic route that takes you along the coast of County Down and the Mountains of Mourne. One of the great wonders of the ancient world, Newgrange is older than Stonehenge, Mycenae or even the Pyramids of Egypt. Foremost among the passage-tombs of Europe, Newgrange has long evoked the wonder of archaeologists and laymen alike. The magnificent entrance slab – ‘one of the most famous stones in the entire repertory of megalithic art’ – is especially satisfying, the confidently executed spiral and lozenge motifs still crisply defined after 5,000 years. Not far from here is Trim Castle. The castle, on the shores of the Boyne, has an area of 30,000 m². It is the remains of the largest Norman castle in Europe, and Ireland’s largest castle. Just north of here lies The Hill of Tara. Located near the River Boyne, this ancient contains a number of ancient monuments, and, according to tradition, was the seat of the High Kings of Ireland. On to Belfast. This robust northern metropolis now has a population of nearly half a million people. The world’s largest dry dock is here, testament to the building of the Titanic here. Take one of the cities famed Black Cab Tours and let your experienced, impartial and friendly driver acquaint you with the history & culture of Belfast. 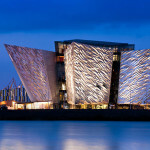 Tours include The Titanic and Cathedral Quarter and other areas of the city including visiting some of the famous murals that represent both sides of the political divide. Take the ferry from Magillian Point, Limavady to Inishowen. Travel to Culdaff Lunch at the Front bar, McGrory’s, which has a great selection of food highlighting local produce with seafood a specialty. Their Seafood chowder, mussels or Inishowen oysters washed down with a perfect pint of Guinness is famous far and wide ! From here head to the Isle of Donagh and you will be rewarded with stunning views as you drive. Malin Head – this spectacular headland is Ireland’s most northerly point also known as Banba’s Crown. For the adventurous walker there is the ‘wee house of Malin and the rock formation ‘hells hole’. Visit the Famine village, which is an outdoor museum that tells the story of life in the area from the Famine back in the 1840s, through the 1900s to the present day. Different to any other tourist attraction in Ireland the Famine Village depicts life in Ireland as it was, not commercialised, interdenominational, and interspersed with humorous anecdotes of Irish life. Travel to Donegal town. Drive through the Gap of Mamore on the way; descending from Mamore Gap offers panoramic views of the Atlantic Ocean. Today take a trip to Ardara Heritage Centre, based in what once was Ardara Courthouse. The main theme of the centre is a profile of the traditional Donegal tweed industry and describes the stages in the manufacturing chain. Visitors learn how sheep are shorn of their wool, before it is woven into the cloth that is made into the durable tweed garments that are famous around the world. Drive down the Glengesh Pass towards Glencolmcille Folk Village and visit Silver Strand beach which is a spectacular hidden gem. It is horse shoe shaped, with the land circling the sea like a torc. The Folk Village Museum offers an excellent guided tour for the visitor where you will experience life as it was in the 1700’s, 1800′s and 1900’s. The thatched cottages are exact replicas of those belonging to that era and are furnished accordingly. Travel towards the village of Carrick and onto the spectacular Sliabh Liag cliffs. cliffs Stop for Lunch at Ti Linn Café, Sliabh Liag Cultural Centre. From Teelin harbour, take the impressive 36ft passenger boat that will bring you close to the spectacular Sliabh Liag cliffs, standing at 600 metres. Take a stroll along the stunning Pilgrim’s Path up along the Sliabh Liag Cliffs. Don’t forget to bring your camera! Depart on the coast road and stop for afternoon tea at the award winning Kitty Kelly’s restaurant and bistro located in a beautifully restored 200 year old farmhouse. Enjoy some Donegal fiddle music & dances performed by Joe Mc Guiggan. Continue along the coast road towards Donegal Town taking in some of the stunning viewing points including Fintra Bay. What a wonderful area of the Wild Atlantic Way. Stop off briefly for 20-30 minutes at Mullaghmore Beach. Mullaghmore is one of the best big wave surfing locations in the world. Arrive at Rosses point in Sligo and take a walk. Starting from the Church of Ireland, the walk takes you along the promenade where the Garavogue meets Sligo Bay. With the mountains to your left and the old village of Rosses Point to your right this stretch takes you to the Pier and the Lady Waiting on the Shore, dedicated to all the women from Rosses Point who waited behind as their loved ones went to sea. Lunch in Yeats Tavern, Drumcliffe, Co. Sligo. Visit famous Irish writer WB Yeats burial place and see the 6th century high cross at Drumcliffe Church. If you have time travel to Grange Island View Riding Stables, Moneygold, Grange, Co. Sligo and enjoy the sensation of trekking on the beach or sit back, relax and enjoy a trip in a carriage ! Dinner in the Pub with the Well at Harrys Gastro Pub, Rosses point promenade. The pub has been in the Ewing family for 5 generations, since 1870. Travel to Strandhill. Seatrails in Strandhil provide guided archaeological and historical walking tours within and close to the coastal zone of County Sligo. Both town, coast and county are steeped in history and archaeology. Take time to relax in Strand Hill, have a stroll around, have a seaweed bath and a leisurely lunch. Imagine relaxing back into a luxurious steaming bath of fresh seawater and wild, organic seaweed. Floating effortlessly in a soothing and tranquil state, your skin feels smooth and renewed. Breathe deeply and sense the tension, aches and pains simply slip away: an ideal way to unwind any time. VOYA Seaweed Baths and organic treatments are especially recommended for those who are over worked, stressed or simply seeking an effective natural detoxifying process for the skin. Lunch in the Strand Bar, Strand Hill. What a great place to finish the Wild Atlantic Way! A short coastal footpath leads to Carrick-a-Rede Rope Bridge. On the way, there are wonderful vantage points to stop and take in the natural beauty. The geology, flora and fauna have won Carrick-a-Rede recognition as an area of special scientific interest. 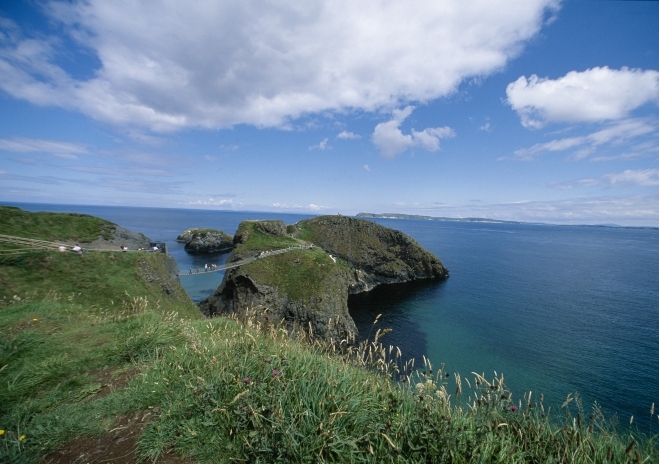 Fulmars, kittywakes, guillemots and razorbills breed on the islands close to the rope bridge. Of course, Carrick-a-Rede also boasts an exhilarating rope bridge experience. Traditionally fishermen erected the bridge to Carrick-a-Rede island over a 23m-deep and 20m-wide chasm to check their salmon nets. Today visitors are drawn here simply to take the rope bridge challenge! The Giant’s Causeway is Northern Ireland’s most famous landmark and has been an official Unesco World Heritage Site since 1986. Formed between 50 and 60 million years ago, the ’causeway’ takes its name from the legends of Finn MacCool and draws people from far and wide to this corner of north Antrim. 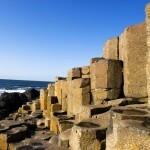 Whether you are just researching about Ireland or planning an Ireland vacation, The Giants Causeway is a must see! The north Antrim coastline in renowned for its scenic beauty and the Giant’s Causeway is its unique jewel in the crown, known to the Irish as the 8th Wonder of the World. A jagged promontory of neatly packed columns of hexagonal basalt rocks created some 6 million years ago by a flow of basaltic lava. As the lava cooled it formed these distinctive hexagonal shapes just as the bottom of a dried riverbed would crack into shapes. Are you thinking that Ireland car hire trip isn’t for you? Why not check out Limerick Travel or Let’s Go Travel for other ideas!